We've lived here 15 months now and the top of the kitchen cabinets have remained naked. have been prodding me to decorate up there. Now there is a Very Fine Line for me between lookin' good and clutter. When I am at somebody else's house, lots of things seem pretty to me. At our house it gives me the jitters...so I lean towards the less is more camp. When my husband started talking about decorating up there too and I knew it was time. I tried really hard for a french country look using things I already have. I also tried really hard to avoid the Cracker Barrel look. I love Cracker Barrel too but that's not the look I was going for. The love of my life mentioned that he would like "no fake leafery up there". It's over there in the silver pitcher that was passed down to me by my Aunt Doris. Aren't you impressed with my photography skills about now? When I stand back and look, I'm pretty happy with it. Those are real apples and they will have to be replaced with lovely fauxs asap. I'm glad it's all up there now. Do you decorate up on top? In other good news, I signed up for Photography 101 with Shoot Fly Shoot today. Hope they can help me!! Yes, let us know how the photography class goes. I could really use one to. Trying to read my camera manual makes my head swim. I love the Cracker Barrel store not too fond of their food (I must be the only one). The top of the cabinets looks cute. I only have one side of my cabinets that have space on top. The other side goes to the ceiling. I just put one thing up there - my collection of white soup tureens. Gives me a space to store and show off a collection I would otherwise have a hard time finding a place for. If I had an up-on-top I would! It looks great! I wouldn't add or subtract one item. Hey, your photos look good to me! My camera broke on July 4th so I've been taking all my blog pictures with my Iphone. My son was showing me a few tips about how to take pics with my phone during lunch today. I don't remember a thing! HA HA! Very pretty Stacy!..Funny when you mentioned Cracker Barrel...my sister has 2 large ledges and has many of her antiques on the ledge...one day, she said, "I really need to take down many of those items as my house is looking like Cracker Barrel..Love what you did and you should be happy with it as you did a great job! Great job, Stacey! I love all the pretty items that I see at Cracker Barrel; but, if I brought it all home, it would drive me nuts!! You found a great balance! I agree that too much on the top feels cluttery (and are dust collectors), but a little interest and color can make a big difference. Nice job. I love the on top option of decorating.. I too am a member of the less is more camp. Stacey, I love the picture by the chicken! I think that you have done a great job. Pretty but not too much. I have a bird theme going on the top of my cupboards to match my bird blinds I made. When we did the kitchen in the basement I opted for cabinets to go clear up to the ceilings. Figured cleaning the tops of one was enough. Not getting any younger. lol! Thanks for sharing with SYC. I grew up in a CLUTTERED house and I try to keep the clutter to a minimum. In the kitchen, I don't want anything on the counters, but it isn't my kitchen so Steve gets to leave out what he wants. I love it just as it is, Stacey...you did well! Please let me know what you think of your photography class...I've been thinking of taking one myself. Would love to hear your feedback! I loved the classes I took from Shoot Fly. In fact, I have a link on my side bar to sign up for classes, because I loved them so much. Your decorating looks great. I don't have enough space above my cabinets to decorate. Your kitchen looks great..I opted not to decorate the top of my cabinets in this house but after seeing yours, I may re think that decision...but it won't be for awhile. We are in the process of packing everything up for an unplanned remodel..a minor leak in a pipe has turned into a huge deal..new wood floors, cabinets refinished, the list goes on.. Anywho, I've decided to have my cabinets painted and glazed and am leaning towards Benjamin Moore white linen but can't decide on the glaze...do you have any idea of the color and glaze on hour cabs? It is exactly what I want (based on the color they look on my screen)..would appreciate any info... I'm a loyal reader from Frisco! It looks great, Stacey! I love that little wire shelf. The tops of cabinets are so hard to decorate. I need to take a pic of how I have mine now so I'll remember where everything goes after all the holidays. I was just thinking I won't have my "regular" decor back up until after Christmas because I go from fall/Halloween to Thanksgiving and straight to Christmas. LOL! It must be great to have some space to decorate above cabinets! I have none. Enjoy your photography class! It's fun to learn how to get more usage from your camera. 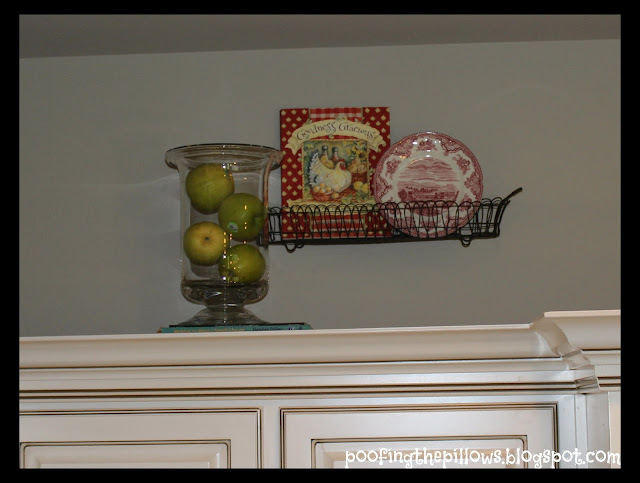 I wouldn't need any prodding to add stuff on top of my cabinets! I love displays on top of cabinets in the kitchen. Your rooster is darling. LOL I spewed coffee when I read the title of this post! 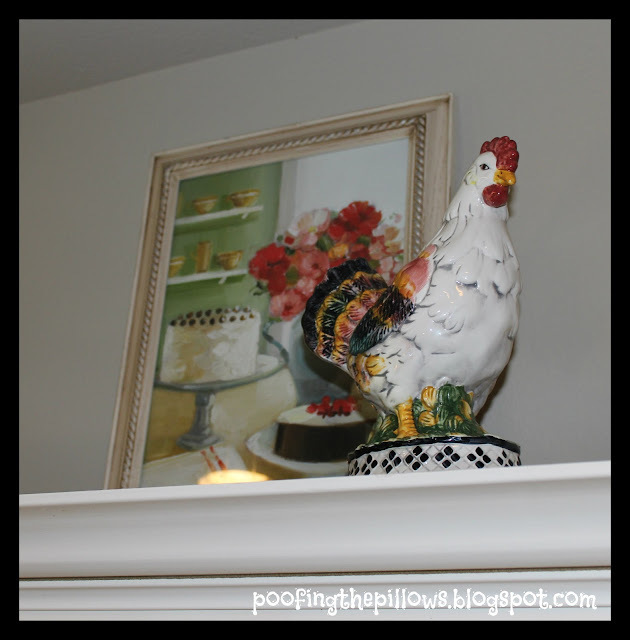 I love your roos....they look good in your home with the pretty reds! I would love to take a photography class too, Stacey. Yes, when I had high shelves, I decorated them. I always tend to overdo though. I like your little vignettes. Just enough. The wire shelf is perfect to hold treasures up where you can see them. Great idea. p.s. 62 this morning, woohoo!!! Stacey, Let us know how your photography class goes. I could sure use some help. I just practice, practice and see what happens. I use the manual almost all the time now! I think you did a great job decorating the top of your cabinets. I know what you mean about less is good. I'm still trying to get that one. You did a great job! The older I get, "the less is more" philosophy is for me too. You did a real good job! I like the simple, yet colorful look you gave to it. Congratulations on the photography course. I would like that too. Your decor is lovely. Less is more!! I'd love to hear about how the Shoot Fly Shoot course works for you. And...may I ask...what kind of camera do you use?